What the heck are those displays of barrels you sometimes see outside at Shinto shrines, especially at this time of year? My friend says they are sake barrels and full of rice wine. I find that hard to believe because I’ve seen them stacked up to six barrels high. If there’s really sake inside, wouldn’t such stacks be dangerously heavy, particularly in case of an earthquake? Wouldn’t there be danger of theft? Please could you get to the bottom of these barrels? Those are indeed sake barrels, but as their name reveals, they are not full of rice wine. When displayed near a Shinto shrine, such barrels are called kazaridaru, which means “decoration barrels.” As you surmised, the barrels on display are empty, at least in physical terms. Spiritually, they’re chock full of significance. These days, the word miki (or o-miki when given its honorific prefix) is reserved for rice wine used in Shinto rites and festivals. Sipping a cup is still a prayerful act of symbolic unification with the gods. 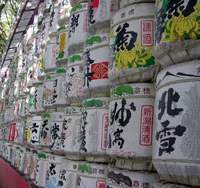 Shinto shrines and sake manufacturers maintain a symbiotic relationship, in which the shrines conduct rites to ask the gods for the prosperity of the brewers, and — this is where the barrels come in — the brewers donate the grog that shrines need for ceremonies and festivals. There is no particular season for donations, according to Hasuo. Smaller shrines usually get their o-miki from local sake companies, but two shrines, Meiji Jingu in Tokyo and Ise Jingu in Mie Prefecture, look after the entire national product by accepting donations from every rice-wine brewer in the country. Given that there are about 1,800 sake manufacturers in Japan, that’s quite an undertaking. The logistics are handled by a special committee at each shrine called the shuzokeishinkai (brewer reverence committee), which works out who sends what. 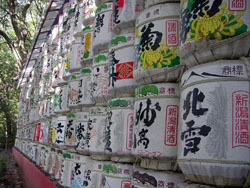 When it comes to barrels, the committee will ask for only as many full ones as the shrine actually needs for festivals and ceremonies. This strikes me as an example of traditional Japanese values: Shinto gods don’t make unreasonable demands of people, and people show respect for the natural world inhabited by Shinto gods by avoiding waste. At many shrines, including Meiji Jingu, empty barrels received as donations are stacked and bound together, then fixed with rope to a simple frame to keep them from falling over. Other shrines, including the Hachiman Shrine in Kamakura, have a permanent wooden structure that looks like a gigantic bookcase on which the barrels are neatly shelved. Smaller shrines line up their casks on a dais or simply display them wherever it’s convenient. A few shrines don’t have to rely on donations to get their o-miki because they brew their own. The number of shrines doing so, however, is extremely limited. Rice-wine production has been regulated in Japan since the eighth century and even shrines making sake for onsite consumption are required to have a government license. This is true for individuals too, which is why you don’t hear about home sake brewing as a hobby in Japan. In any case, there are only four shrines in all of Japan licensed to make sake. One of them, Okazaki Hachiman Shrine in Yamaguchi Prefecture, makes an unusual white sake called shiroki that can be sampled during the shrine’s fall festival, held on the third Saturday in October. Another 40 shrines are licensed to make an unrefined rice wine called doburoku, also served at festivals. Rice wine is not normally stored in barrels because it picks up too much of the taste and smell of the wood. But a short stay gives the sake a pleasant woody aroma, so upon request brewers fill barrels (from a steel tank) a few days in advance of festivals and other special occasions. You don’t have to be connected with a shrine to get your hands on one of those sake barrels, which are called komodaru. (Komo is the woven straw wrapped around the staves.) You can buy an empty barrel if you really want to, or you can order a full one for a wedding or party. A standard komodaru holds four to (an old measure), or 72 liters, and will set you back about ¥100,000. If that’s too much sake for your party but you still want the impact of a big barrel, you can request an agezoku (false bottom) that reduces the fill to as little as one to (18 liters). It’s a custom at New Year’s parties, weddings and consecrations of new buildings to break open a barrel of sake in a ceremony called kagamibiraki. Kagami usually means “mirror,” but in this case it refers to the wooden lid on the top of the barrel. A favored few are armed with wooden mallets, and after appropriate wishes for health, happiness and prosperity, the hammer holders give a cry and smash open the top of the barrel. Cups of the sake are distributed to all and a toast is made. And after that? Well, there’s really only one thing to do: try to get to the bottom of the barrel! To learn more about Japanese rice wine, try a visit to Sake Plaza (1-1-12 Nishi-Shinbashi, Minato-ku, Tokyo;  3580-7744). You can pick up two free English-language booklets, and get more detailed information in Japanese including tips on where to go for sakagura kengaku (sake brewery tours). There are roughly 800 bottles of sake on display, from all over the country, and for ¥500, you can sample five different sakes from a rotating roster of 100 brands. They’ve got barrels on display in the side lobby and sell a nifty necktie with the kanji for “sake” all over it (¥2,500). Open 10 a.m. to 6 p.m. (closed on weekends and holidays); last tasting at 4:45 p.m. Puzzled by something you’ve seen? Send a description, or better yet a photo, to whattheheckjt@yahoo.co.jp or A&E Dept., The Japan Times, 5-4, Shibaura 4-chome, Minato-ku, Tokyo 108-8071.